Octopuses are the animals of the class cephalopod mollusk (animal feet located in the head), the order Octopoda with coral reefs in the ocean as the main habitat. Octopus consists of 289 species covering a third of the total species of Cephalopoda class. Octopus has 8 arms (not tentacles) with a suction device in the form of concave dots on the arm used to move on the ocean floor and capture prey. Octopus arm is hidrostat muscular structure which consists almost entirely of bone or muscle layer without external skeleton. Unlike other cephalopod animals, most octopuses of the suborder Incirrata have a body consisting of muscle and no skeleton inside. Octopuses do not have a protective shell on the outside as well as Nautilus and did not have a shell in or bone like cuttlefish and squid. Part is the hardest part of the body of the octopus that is used as jaws to kill their prey and bite it into small pieces. Very flexible body allows the octopus to tuck themselves in a very narrow cleft of rock on the seabed, especially when running away from predators such as fish, Moray eels. Octopuses are less well known people from Cirrata suborder have two fins and shells in which the ability to squeeze into the small room to be reduced. Octopuses have a relatively short lifetime and some species only live for 6 months. Larger species such as the North Pacific giant octopus whose weight can reach 40 pounds be able to live up to 5 years under the appropriate environmental conditions. Reproduction is one cause of death, octopus males can only live a few months after mating and female octopus die die shortly after spawning. 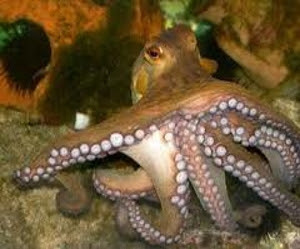 Deaths caused by negligence of the octopus to eat for about a month while keeping the eggs have not hatched. Abdominal sheaths octopus body called the mantle which is made of muscle and looks like a bag. Octopuses have three heart consisting of two pieces of heart to pump blood to two gills and a heart to pump blood throughout the body. Blood contains proteins Hemosianin octopus with a rich copper to transport oxygen. Compared with Hemoglobin is rich with iron, Hemosianin less efficient in transporting oxygen. Hemosianin soluble in plasma and not bound by red blood cells so that the blood of a pale blue octopus. Octopuses breathe by sucking water into the mantle cavity through the second fruit sprayed out through the gill and siphon tube. Octopuses have gills with a very fine division, derived from the growth of the outer body or part of the experience vaskulerisasi. Male octopuses reproduce by putting the bag into the cavity spermatofora coat female octopus uses a special arm called hectocotylus. The third right arm normally be hectocotylus. In some species, the female octopus can keep the sperm in order to stay alive until the eggs become mature. Once fertilized, the female octopus can lay up to about 200,000 items. The number of octopus eggs can vary depending on each individual, family, genus or species. Female octopus hang a collection of egg-shaped capsules that form strands in the ceiling of the nest. After the eggs hatch, the larvae octopus for a while drifting along with a swarm of plankton copepod prey on the form of feed, larval crabs and larval starfish until quite large and heavy to be on the seabed. Some species of octopus with deep-sea habitats do not need to go through cycles of drifting along with a herd of plankton. Period as the larvae are full of danger now because it is easy prey to the octopus larvae-eating plankton as a part of the herd plankton.